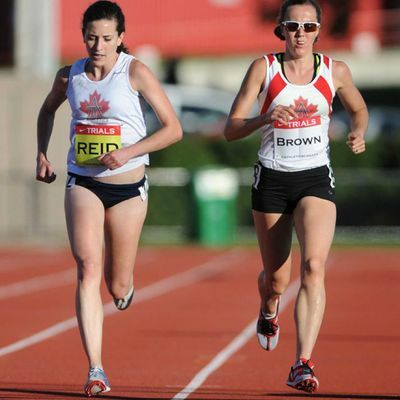 CALGARY -- Sheila Reid is the freshly minted women’s champion for the 5,000 metres following her victory at the Athletics Canada Olympic trials on the weekend in Calgary. However, she is not bound for London and the Olympic Games starting July 27, despite her status as best in the land. A Canadian title doesn’t guarantee an Olympic berth, the price some athletes pay for the aggressive Own The Podium program which often places domestic qualifying standards above international standards. Megan Brown (right) of Puslinch and Sheila Reid of Newmarket race in the women's 5,000 metres final at the Canadian Olympic and Paralympic track and field trials Friday night at Calgary. Brown finished second, 1.21 seconds behind Reid. Reid won the race Friday night in 16 minutes, 15.23 seconds, better than one second ahead of fellow Athletics Toronto and former Newmarket Huskies teammate Megan Brown (16:16.44) but well off the Canadian qualifying standard. It was a bittersweet victory for the 22-year-old Newmarket resident, who had one B standard qualifying time to her credit and required at least one more in addition to a victory in Calgary to earn outright a ticket to London. An appeal to Athletics Canada to include Reid on the London-bound team under the Rising Star exemption for top prospects was denied Saturday. A subsequent appeal to a three-member panel was presented last night with the Athletics Canada ruling pending as of this afternoon. Reid required nothing less than a victory in the 5,000 metres to be considered for the Olympic team. The multiple NCAA track and cross-country champion for Villanova University also needed to beat the Canadian B qualifying standard of 15:30.0. The A standard is 15:20. However, competing in altitude in Calgary is not conducive to optimal performance for distance athletes. 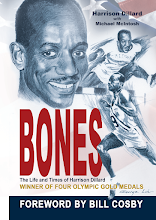 For the appeal, the Reid camp cited the Rising Star exemption, an option unique to track and field. Under Rising Star, promising young athletes have a one-time chance to qualify despite not attaining A standard results. In the case of Reid, the opportunity would be a valuable experience looking ahead to the 2016 Olympics in Brazil. She knows the appeal is a longshot. Ironically, in most countries her victory in Calgary would have sent her to London. “In any other country you qualify by meeting standards and wins,” she said. “This is time-chasing more than about wins. But I know the rules going in so there is no sense complaining about the rules half-way through. The decision does not alter Reid’s plan to compete professionally in Europe this summer.